Jesse, thanks for the interview with some of the Downton Abbey cast. It was fun to listen to. I am a fan of this show on PBS and look forward to the 2nd season. Why didn't you discuss more the historical context for the drama? I think you missed an opportunity to set your interview apart from several other interviews the Downton Abbey cast has done in recent weeks promoting the 2nd season. The period of the show is immediately following the British empire's peak of power and influence. The characters in the drama afford to live lives of honor, nobility, and leisure because, to a large extent, they are the beneficiaries of Britain colonizing the Indian subcontinent, in addition to de facto colonizing Persia (now Iran). For decades during this period, most of the natural resources and wealth of these countries flowed into British coffers. As much as I enjoy watching the nobility of the British aristocracy, something in me is bothered when I consider that all his opulence and leisurely lifestyle was made possible by inflicting much suffering and economic dislocation on the peoples of what are today India, Pakistan, Iran, etc. The Picture of Dorian Gray, which came out in 1890, is an apt metaphor for the ugliness that lies beneath much that is beautiful in British society in that period. 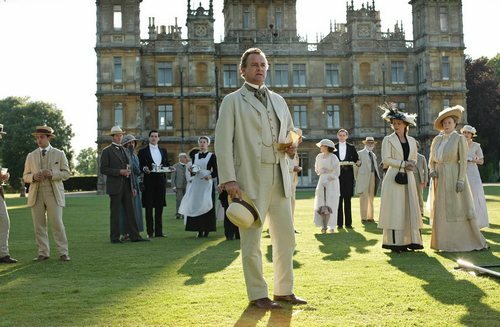 As Americans, we should be especially wary of being overly captivated by the discreet charms of British aristocracy. 1) is this in order to boost numbers/new listeners for the opening episodes, and not intended to remain permanent after the flurry of publicity, or once you've seen if it can boost PRI subscriber stations? 3) if it's not super-deliberately on-purpose, count this as one former a la carte TSOYA listener who would enjoy continuing to take content-specific pieces on the bus without swiping through parts of episodes.